Florida has been one of the most popular destinations for active adults and retirees for decades. With thousands of age-restricted and age-targeted communities in the state, active adults find that Florida caters to their needs better than almost any other state. Active adults seeking an age-restricted community in a tropical climate surrounded by entertainment and recreation should seriously consider the sunshine state. While Florida has a humid subtropical climate, the heat is tempered somewhat because no part of the state is too far from the ocean. During the summer months the average temperature is in the low 90s while the winter months bring temperatures around the mid 50s. Known as the lightning capital of the United States, Central Florida experiences more lightning strikes than anywhere else in the country. Afternoon thunderstorms are common throughout the state resulting in Florida having one of the highest annual averages of precipitation in the country. Florida borders Georgia and Alabama to the north and is completely surrounded by water to the east, south and west making this one of the country's only peninsula states. To the west is the Gulf of Mexico and to the east is the Atlantic Ocean. The southern region of Florida is known as the Everglades and is made up of marshes and swamps. 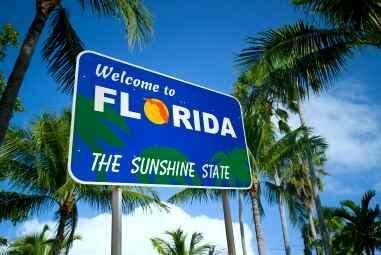 Florida became the 27th of the 50 United States in 1845. During the 1920s, economic prosperity stimulated land development only to be halted by two hurricanes in the late 1920s followed closely by the Great Depression. Today, this southern state is a favorite among active adults looking for a warmer climate or cheaper cost of living and now is ranked 4th in population with approximately 19.5 million residents. Active adults who call this state home enjoy endless opportunities for entertainment and recreation. There are 161 state parks in the state offering hiking, bird watching, camping, and horseback riding. Many of these parks not only offer recreational opportunities but also educational services geared towards informing people about this state's unique wildlife. Some of the larger cities offer great attractions such as Disney World in Orlando, The Kennedy Space Center in Cape Canaveral, or the famous South Beach in Miami. Sports fans will love the numerous professional sports teams in the state such as the Miami Marlins (baseball), Jacksonville Jaguars (football), Orlando Magic (basketball), and Tampa Bay Lighting (Hockey). No matter what your interests or hobbies are, this beautiful state has something for you. Florida is a very friendly tax state for active adults. The state enforces a sales tax of 6% on all goods sold. Additionally, counties are able to levy additional tax at their own discretion. A major factor for many people who would like to continue working is the lack of income tax on individuals. Local governments rather than the state collect property tax. While property taxes are among the highest in the country there are several exemptions. One exemption that may catch the eye of Florida active adults is the Senior Citizen Exemption. This exemption is available in certain counties only and is valued up to $50,000 for residents 65 and older with a gross income below $20,000. Active adults who need regular medical attention will be glad to know that Florida has 252 active physicians per 100,000 people. That is one of the highest physician counts in the entire country. There are 303 hospitals in the state offering state-of-the-art care, treating everything from the common cold to cancer. Active adults in this state live well knowing that if they ever need help there are numerous medical options in the area.